The SG Spieringshoek, located in Schiedam, can accommodate over 1,400 students. In order to be able to offer as many students as possible the best education, the facilities also have to have the highest quality. That is why SG Spieringshoek has developed some silence spaces for the students to retreat. 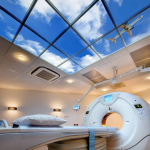 LED Sky Ceilings ensures that there is a pleasant atmosphere in each of these rooms. The students really love using the study rooms, especially for working on group projects and for doing homework. 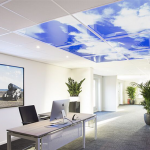 The LED Sky Panels ensure a sense of spaciousness in the relatively small study rooms. The students also really find the effect of the cloud ceilings spectacular!